The prong setting holds a gem in prongs made of the same metal as the ring. 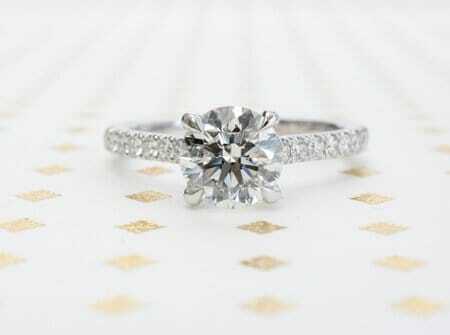 The prong setting is often used for a solitaire, which means the band only has one large stone. In other settings, the prong lifts the central stone above smaller stones. Another style held by prongs is the Tiffany setting, which often has six long prongs that grip the stone around its edge to secure it. Prong tips can be round, pointed, flat or split. 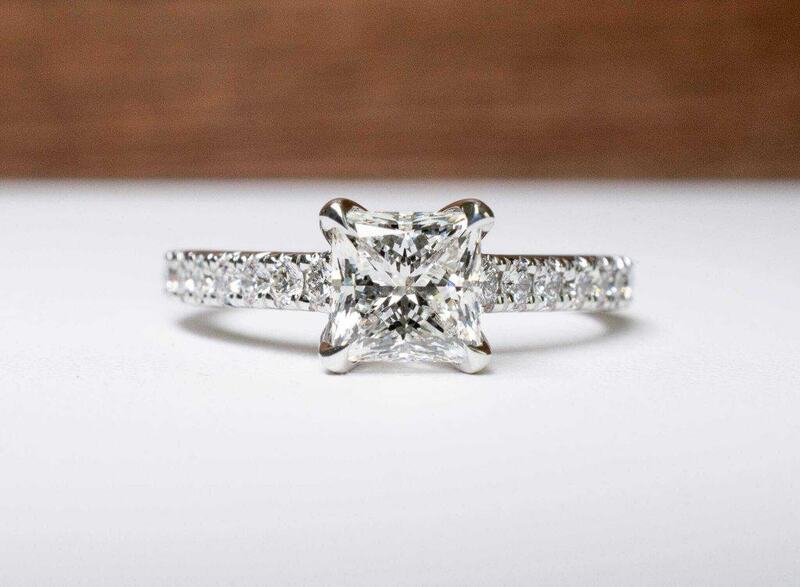 When a prong setting has a closed back, it enhances the brilliance and fire of a pale stone. In this setting, the central stone is in a collet encrusted with smaller gems as in a halo. This setting can be combined with a prong setting to the central stone. Sometimes, the central stone can be a coloured gem such as a ruby, sapphire or emerald that is surrounded by smaller diamonds. The shank of the ring can also be set with diamonds. In a three-stone setting, the ring sports a central jewel with two smaller stones on its left and right side. All three stones may be in prong settings. There may be smaller stones on the shank in pavé or channel settings, or they may also be held in their own tiny prongs. In pavé settings, tiny stones are arranged on the ring like cobbles in a pavement. In the more modern micro-pavé setting, the stones are so tiny they’re almost impossible to identify individually. In the channel setting, smaller accent stones are set in a channel cut into the band. A bezel setting describes a stone that is surrounded by a metal band. The ring may also be set with smaller stones. The bezel setting is one of the rub-over settings, where the metal is rubbed over or around the edges of the stone. Bezel settings are used for both cabochons and faceted gems. Bezels can be tapered, which makes the gemstone look like it is resting in a cone-shaped cup placed on the ring. Bezels can have corners and come in the shape of squares and triangles. Contemporary rings can have bezels with irregular shapes. They can be made with prongs to hold on to the gemstone. The settings of these types of engagement rings harken back to the 19th and 20th centuries. They can have pierced, split, intertwining shanks encrusted with accent stones and clusters of diamonds in the shapes of flowers or vines. The metal might be filigreed, have floral accents or be decorated with millegrain, which are tiny beads. The central stone may have an old fashioned cut such as a rose or briolette cut or could have been taken from an older ring.